A great alternative to successful commercial WYSIWYG HTML editors, this program is a must-have among the web development community for easy and quick HTML editing with support for templates, FTP transfers, tabbed editing and for most HTML elements like divs, tables, forms and other tags. Like anyone would expect a modern WYSIWYG editor to do, KompoZer can style your elements in an almost unlimited amount of ways. It supports CSS, applying styles to elements (like spans or divs) and styling your page to look neat and professional. This can all be done in the 'design' view. Version 0.8b3 is a freeware program which does not have restrictions and it's free so it doesn't cost anything. 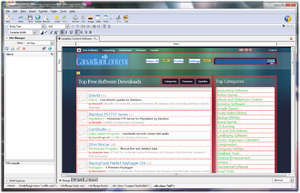 For security reasons, you should also check out the KompoZer download at LO4D.com which includes virus and malware tests. Additional screenshots of this application download may be available, too. KompoZer Web Authoring has a presence on social networks.